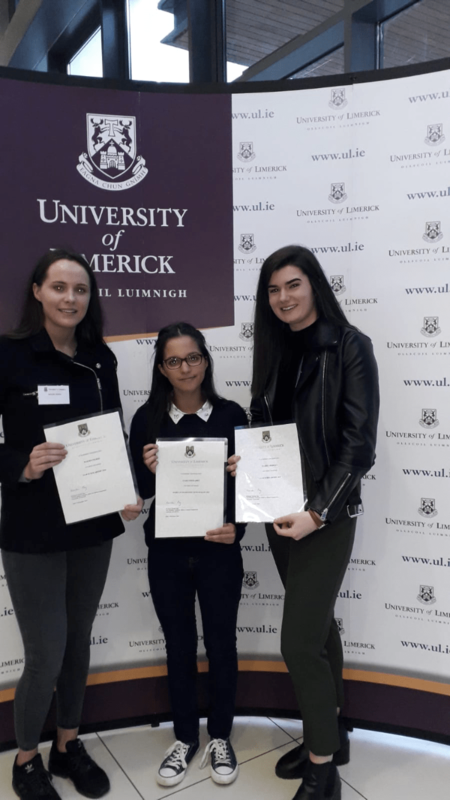 Maeve Pierce, Ciara Sookarry and Isobel Horgan were presented with awards on Monday, Dec 3rd in a ceremony in Kemmy Business School in the University of Limerick. Maeve, who is studying Applied Languages was awarded a UL 40 Scholarship. Isobel was also awarded a UL 40 Scholarship and is studying Biological and Chemical Science. Ciara is studying electrical engineering and was awarded an engineering scholarship as well an Intel scholarship. All three students are well settled in Limerick and are really enjoying their respective courses.